This is one of our new favorite things here at SilverCrow. Our little treasure capsule pendant is made of silvery metal and plastic tubing. It is easy to assemble and lots of fun to use! The end caps even features tiny little hearts in the border decoration. Make a fairy catcher and display your captive in the tube. Write a love letter and keep it close to your heart. Add some natural crystals for protection. The possibilities are endless for sure! These are not waterproof or airtight, so if you want to add glitter or a fluid, please be sure to seal the openings with wax or epoxy. 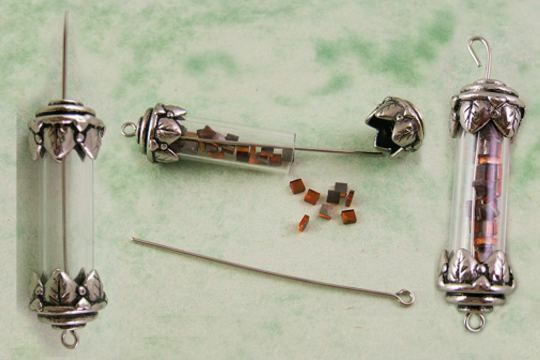 Each little kit contains 1 Plexiglas tube, 2 head pins and 2 end caps. Several pendants shown for illustration only. The piece measures 1-1/2 inch long and the capsule measures 3/8 inch wide.